Last weekend, I watched the live stream of what is likely to be the last Tragically Hip concert. Ever. Gord Downie, the lead singer, announced in May that he has terminal brain cancer. The news was startling. No matter how often it happens, and it is too often, the idea that such a brilliant and relatively young man could be so ill is difficult to absorb. We tend to believe our icons are immune. The reality that, after 30 years, this might be the last live performance had me reflecting on my relationship with the Hip. I began my adult life with this band and their music and poetry defined my twenties. “New Orleans is Sinking” blasted out the roof of my first car and “Ahead by a Century” marked a significant change in the direction of my life. When I feel too far from my roots, I just have to listen to a Blue Rodeo or Tragically Hip song and all is right with the world again. In his face, you could see Downie soak in every single moment of love and appreciation from the crowd. I heard a number of times that Canada closed at 8:30 EDT for the event that filled parks and city streets across the country, not just the over 6000 strong in the stadium. The Tragically Hip somehow touched that impossible to define Canadian-ness and it brought us together as a nation for just under 3 hours, within our borders and beyond, reaching ex-pats, like myself, across the world. The tears didn’t stop rolling down my face while memory and music played, then echoed in the hours after. My husband joked that to cross the border into Canada beginning on Monday, you will need to successfully describe what Gord Downie wore at the August 20, 2016 concert. Failure to do so will get your passport shredded and your Canadian status put into question. Whether or not you’re a fan, the Hip and hockey are an integral part of being Canadian. Their geography is our geography. Whether we like it or not, that geography defines us. The images of Georgian Bay during the first intermission made me homesick for the land, the clear water, the ice and snow. The storm of lightening and thunder on that screen has been taking place inside me ever since I left Canada. I took it with me. I wish I could say with as much courage and grace, too. The setting of the 1996 video for “Ahead by a Century” centers around an old farmhouse amidst a field of bare trees and long brown grass crushed by melted snow. There is this rural late 70’s feeling to it, before so many of these farms were abandoned. For me, the frames in the video are the long forgotten photos found in the house 40 years later, empty and abandoned. This was our life. And abandoned ruins and the lives they were a part of were the themes of my own work until I left. Undulating waves washed through wind blown oceans of wheat on the west side of Oklahoma City, where the Great Plains begin. I was out in the middle of it in a proverbial open raft, dragged on an invisible current with nowhere to rest. I could no longer paint. For quite a few years I created very little. And in spite of my silence for much of this year, that is no longer the case. I have simply not been sharing new work. Most of it isn’t worth sharing or is incomplete. I have taken up faces and figures and the learning curve has forced me to point the raft and pick a shore. The water laps gently at my ankles. My travels are far from finished, but the steady breeze is a reminder that the storm isn’t far away. 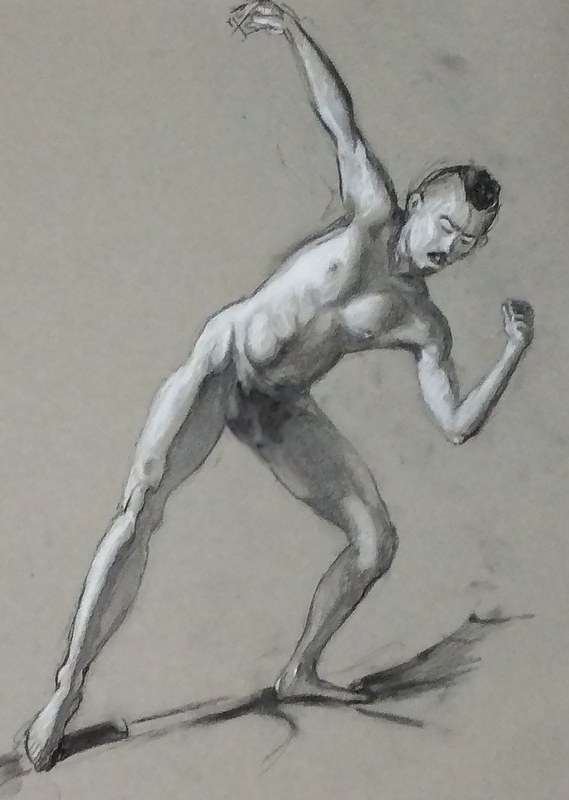 This piece (above*) is simply the best of the hours of figure drawing from the last 6 weeks. So much further to go…. I look at my life and the unspoken challenges I have faced that have brought me here. My poetry is late. It is unfinished – but if I’m smart and lucky – this next part of the story will get the time to be told. And the old geography, although in my rear view mirror, is there to fortify me. I have been singing Hip songs in my head all week. I know I am not the only one. To Gord and the band, I hope my art will grow because you shared yours. Thanks for the inspiration, guys. The book that is the old farmhouses, is expected to be released in the Spring of 2017. Details in the Newsletter this Fall. What a beautifully written reflection. I love the incorporation of Hip lyrics! Like you, I live far away from my roots, and because I like (even love) my life in the UK, I don’t dwell on it much. However, connecting to the CBC at 130am early Sunday morning, and hearing the ‘This is the CBC’ and intro in an unequivocally Canadian accent, made me feel thoroughly Canadian and more ‘me’ somehow. The concert reinforced that. George, sweetheart that he is, watched almost the whole thing with me though he couldn’t walk down memory lane with me in quite the same way, being British with his own deeply embedded resonances. He passed out after the second encore, after fighting to stay awake for the whole thing. As I said, I’m happy here, but I am growing more conscious of the divide in myself. The ‘before the UK’ and the ‘Since then.’ When I visit my family on the West Coast in BC, I get ‘joined up’ with my past for a short while and am able to relax in a way that I can’t define. But that’s the west coast, not Ontario, not a part of my Hip years. The storm over Georgian Bay and the music tapped into me even deeper. Canada, I think, is calling me home. Thanks for the compliment, Steph. It’s funny how some experiences lead us to think about who we are and why where we come from matters. I appreciate your reflection on your life. Your drawings are good and show character. I am looking forward to your new book ” Once Imagined” in the spring of 2017. Thanks Michelle for your wonderful, thoughtful post. The Hip wasn’t really in my radar until I heard about them from Christopher. We spoke to him the morning that the announcement about Gord Downie’s health came out. I have to say, that the CBC was really great, to show the last concert across the country!!! I have always felt that the are the glue that keeps our BIG country together! Thanks also for posting your drawing and sharing with us where you are at…great drawing! Good for you girl!! Well done on this blog. I enjoyed reading it. You are creatively talented in a way that brings me envy and drive to be better at what I create. Thank you. Thanks, Janetta. It’s a good thing when we inspire each other. There is an awful lot of Canadian talent! Yes. That is true too! But some things are so ‘us’ that they just may not translate. I cannot relate to your memories as I am from an earlier generation, , but I was moved by your memories and the way music can bring us all back to our youth , its innocence and its rebirth, just for a few moments . Gord Downie not only renewed memories but he was brave enough to bring us all back to reality. That is a true Artist. I’ve been hibernating, obviously missed yet another brilliant post. Well, not missed, because here it is for me to belatedly read. My husband actually managed to get a (singular) ticket to the Toronto venue, it is was one of those lifetime meaningful events for him. Tragically Hip links Canadians together in a deeply emotional way. You’ve managed to capture that. Great Big Sea , lesser known, is another one, just to the add to list. Your charcoal sketch is amazing. Thanks for the compliments, Ingrid. Obviously, I need to get posting again….